As the temperature starts to fall along with the leaves, it seems the perfect time to hit play on some melancholic indie rock. Enter The War On Drugs, Kurt Vile’s former band, with their third release Lost in The Dream. This Philadelphia band, founded by Kurt and Adam Granducie in 2003 have been gaining attention since their EP dropped in 2007 and they signed to the Secretly Canadian label. 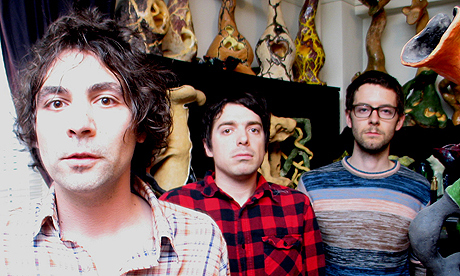 Although Vile and drummer Kyle Lloyd left the band after their first album, The War On Drugs have been successfully recording and touring ever since. Drawing from influences of shoegaze and classic rock, The War On Drugs engulf the listener in their unique vibe of spacey Americana that includes distant keys, and driving rhythms. While the album can seem soft, lead singer Adam Granducie and the band can pack an emotional punch. Each song is layered almost unnoticeably; before you know it you’ve arrived at the skillfully balanced peak of the song. For example, the numerous building guitar riffs on the standout An Ocean Between the Waves. Or the melodic piano that appears near the end of Suffering and In Reverse. Here’s the ‘magical’ video for the single Red Eyes. Released back in March and recorded over a two year period, Lost In the Dream comes after 2011’s critically acclaimed Slave Ambient. Extensively touring for Slave Ambient had a clear effect on Granducie, and inspired the gloomy lyrical content on Lost In the Dream. Common themes of depression and heartache add to the emotional atmosphere of the album and lend themselves to repeat listening. Although it contains no catchy hooks or choruses, Lost In the Dream is a great collection of 10 hard hitting songs that live up to the bands previous album. So when the days get shorter and the skies get overcast, embrace the feeling and get Lost In The Dream.